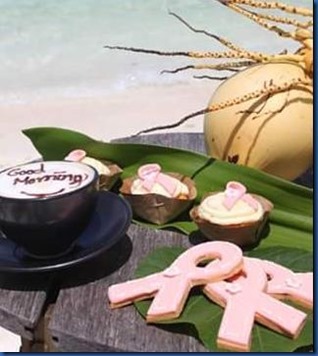 And special pink ribbon biscuits and cakes to treat yourself at the end (see below). 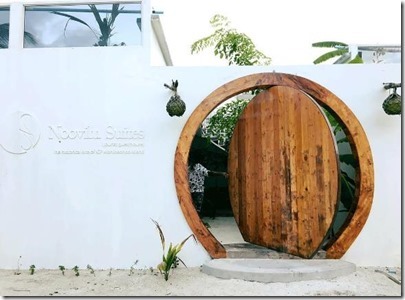 Even with nearly 100 stays in the Maldives, my knowledge of the destination pales in comparison of the travel community whose aggregate experience is many orders of magnitude larger. A while back I did some crude attempts data mining the great store of insight in TripAdvisor reviews and Forum about the resorts most frequently suggested by Destination Experts as well as the resorts most frequently asked about. Those posts are a bit out of date now, but it was still a curious exercise. Now DE’s Stu and Nikki have done their own investigation into the stars of the family properties in the Maldives. 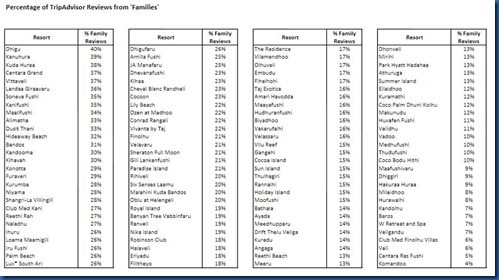 They measured the number of reviews that were tagged as “Family” stays as an indicator of popularity for various resorts in the family segment. The results can be found above (with a link to the original document). Not surprisingly, the bottom group is comprised largely of the “Adults Only” (or “Children Restricted”) resorts. Happy Thai New Year! 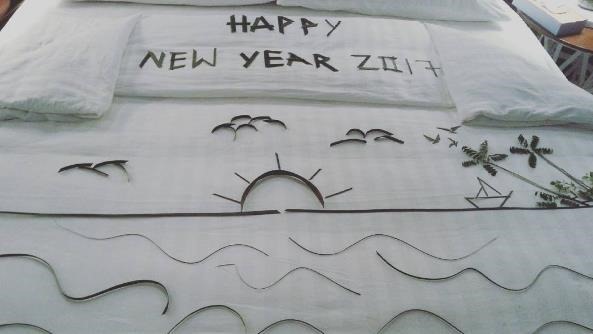 And what a year it has been for Thai visitors to the Maldives. Thailand is the fastest growing country of origin for Maldives visitors with a 233% growth (!) making it the 5th highest Asian source (while being only the 10th largest Asian nation). 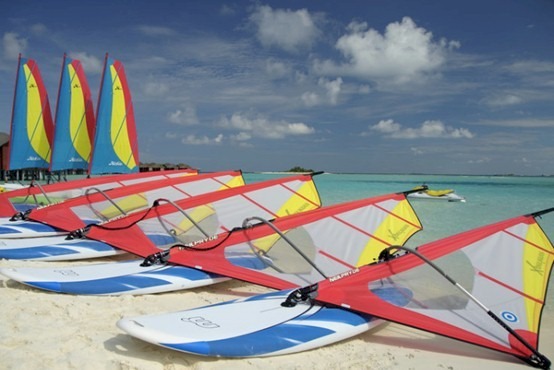 Amari, Anantara, Centara and Dusit Thani are all Thai based properties with multiple properties in the Maldives. Tok Sen Ancient Thai Therapy, which originates from Buddhist Monks, creates healing vibrations through rhythmic pressure on Thai acu-points applied with a special wooden tapper to relax stiff bodies, providing pain relief and deep release for the body and mind. 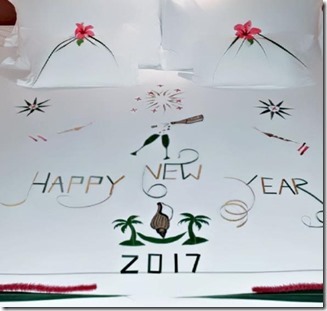 So for those really tough knots from a particularly enthusiastic new years celebration, ask for some Tok Sen.
One of my top 10 FAQs is “where can transient visitors to the Maldives (eg. flight and cruise stopovers) visit a resort island for a single day (no night stay)?” By and large, the resorts have not had this offer for part time guests. The fear is that the island gets overrun by low margin guests just cherrypicking some of the sunshine and beach space without spending money in the restaurants, bars, activities or lodging. 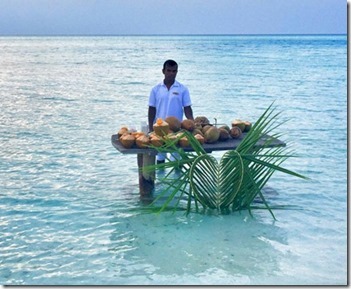 One resort, Anantara Dhigu, is making day visits available. They are managing the risks by tightly containing the number of passes issued. 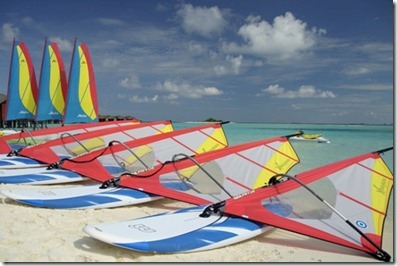 The pass is not a standing offer, but is issued on a case by case basis, mostly when the resort is at lower occupancy. At the moment price is USD 150++ per person (10% service charge, 12% GST) and out of this USD 100 will be used as F&B credit which is non-refundable. I think Anantara is clever thinking that many people stopping in will love the resort so much that they will make it a point to come back for a proper stay Also, by keeping the offer to lower occupancy periods, it can help the overall resort experience for all because the resort can run at optimal efficiency (eg. there’s not a lot of food waste on the buffets with few people there, but the resort wanting to maintain the choice and options for the guests). Lots of fun traditions to celebrate this annual milestone – Hogmanay ‘First Footing’, fireworks and noisemakers (supposedly to scare away the devil), Southern cooking collard greens for wealth and black-eyed peas for fortune. I don’t really cover guest houses, but I couldn’t resist Noovilu Suites’ portal which has one of the most all-aRound delightful ways to let out the old year (see photo above). 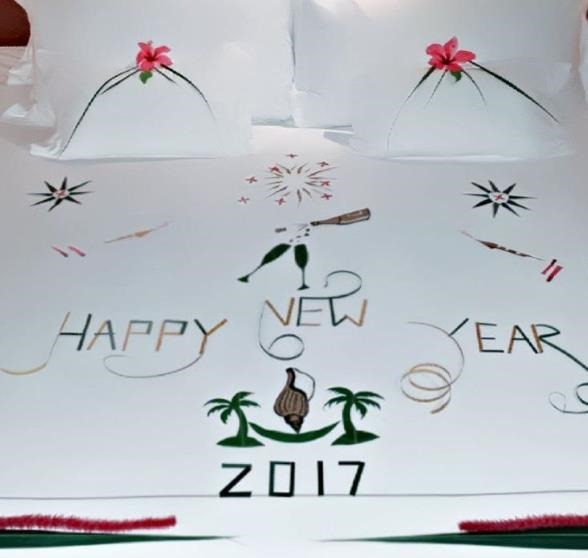 An number of resorts are also marking the occasion with special bed decorations like Anantara Dhigu’s (above) and Amari Havodda (below). 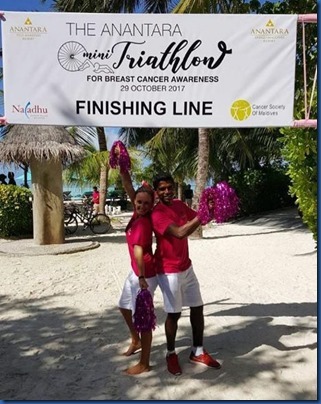 While While the Maldives might have competition for being the top photoshoot destination in the world, there is definitely one top photoshoot in the world…the Sports Illustrated Swimsuit Edition. The 2016 issue which hit the stands yesterday now so hotly anticipated that they have developed a television show to launch it. Famous SI Swimsuit models include Cheryl Tiegs, Christie Brinkley, Elle MacPherson, Kathy Ireland, Paulina Porizkova, Anna Kournikova, Kate Upton and Beyonce. 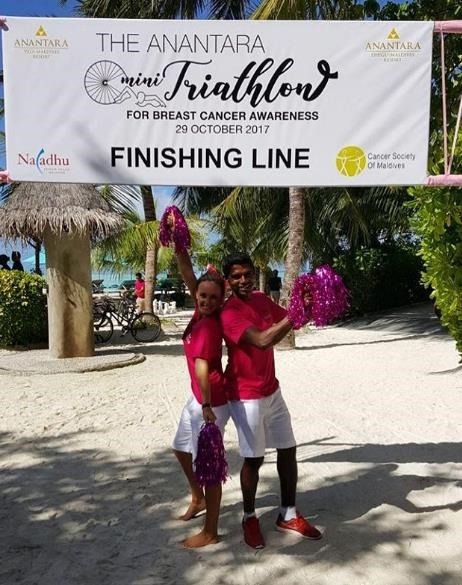 And two of the most famous today – partly for their own reality TV shows – shot their issues in the Maldives. Tyra Banks was on the ascendency to becoming her “Americ’a Top Model” with the 1998 edition shot at Banyan Tree Vabbinfaru. Her previous year’s cover was historic as she was the first black American to grace the cover of the blockbuster annual Sports Illustrated Swimsuit Issue. That year also introduced “America’s Got Talent” Heidi Klum as 1998’s cover girl. The next Maldives issue was 2010 shot at Anantara Veli and Dhigu featuring Christine Teigen, Bar Refaeli, Dominique Piek and Brooklyn Decker. While the USA Swimsuit Edition is the main event, SI South Africa has also been drawn to these neighbouring picturesque Laccadive shores. SI South Africa produced a swimsuit calendar featuring Joelle Kayembe at Bandos, as well as Lee Ann Liebenberg and Liza Botha back at Anantara. And if the pin-ups are not enough, Sports Illustrated has kindly posted a whole collection of videos taken from the shoots so you can enjoy the backdrop of the Maldives with this assortment of aesthetic additions. 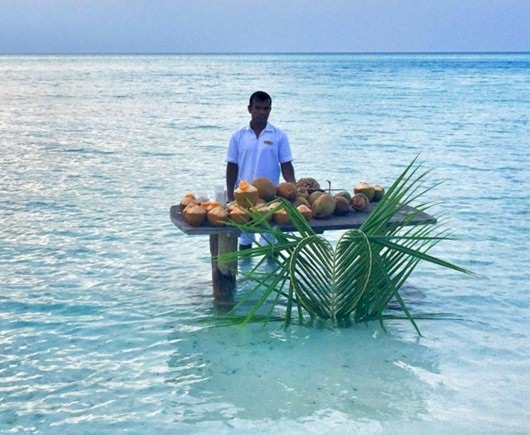 Anantara Dhigu is another resort exploiting its distinctive lagoon for a bit of inside and outside refreshment. They are using it as the venue for their weekly guest cocktails. Make mine with a splash, please. One more sleep until Santa pays his visit to the good girls and boys. 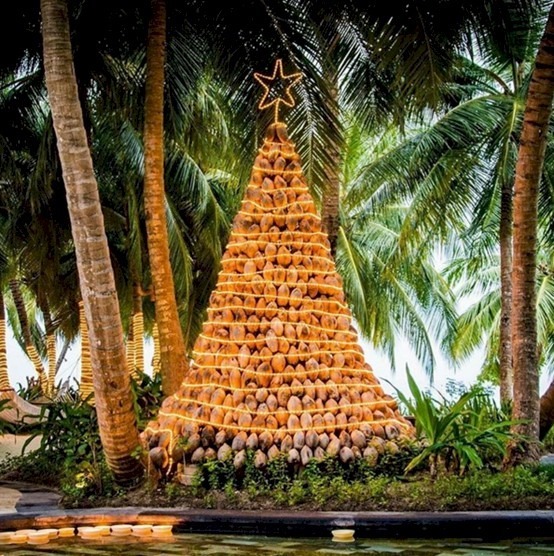 The girls and boys at Anantara (Dhigu and Veli) have been so good this year, they made their Christmas tree from discarded coconut husks. It shines in the day from the bright whit paint as well as at night with the constellation of fairy lights. 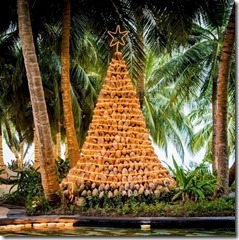 One & Only Reethi Rah also has its own coconut Christmas tree (see below), Anantara has not just one, but three trees. 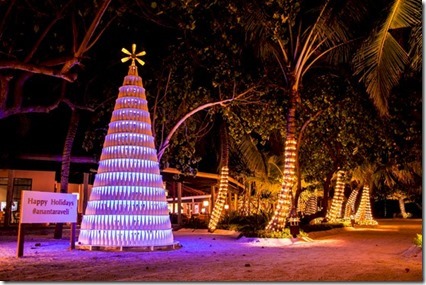 Furthermore, Anantara has gone a step further with another tree made out of old Evian bottles (see below)! 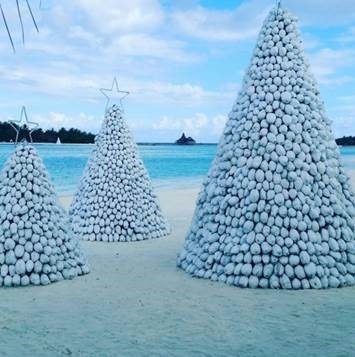 The three coconut trees on Dhigu are 2.5 meters, 3.4 metres and 5.0 metres high, with the tallest one made from 800 coconuts. 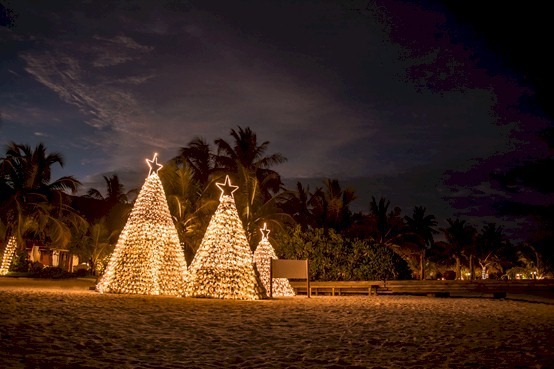 The other two trees take up around 400 coconuts between them. 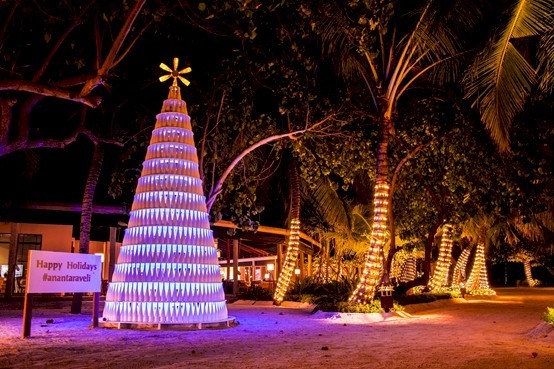 The bottle tree is 6 meters high and is made from 720 bottles. 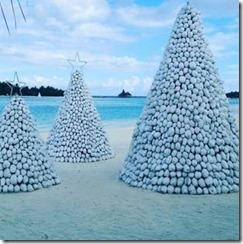 Be a star to the reefs! Just don’t be a star-fish. Specifically, a Crown of Thorns Starfish. 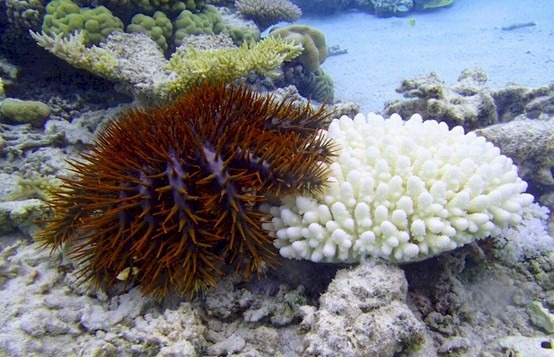 This is one reef species that has had a bit too much reproductive success of late. 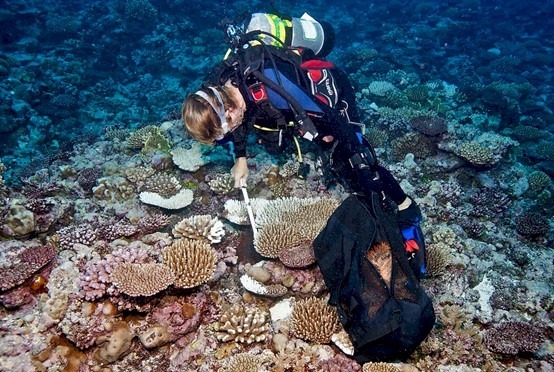 This scourge was highlighted to us during our recent tour when the marine biologist at Zitahli Kudafunafaru noted a number of Noonu reefs that had been decimated by these coral-carnivores. The main cause of the outbreak appears to be a decline in their natural predators, especially the trumpet triton and helmet snail, which have attractive shells that are collected and sold. So a number of resorts a moving into action to reduce their numbers. 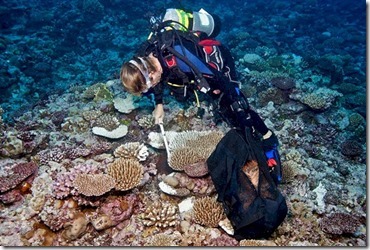 Lily Beach’s ProDivers held a COTS collection which gathered 92! Their spiny “thorns” a venomous so people can’t and should not touch these creatures if they happen on them. 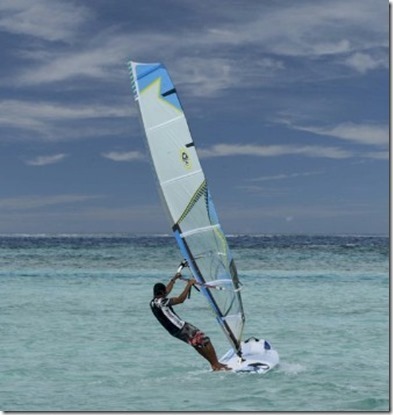 But Anantara Dhigu and Veli are giving guests a chance to get involved with this eco-battle…. The vicious and life-threatening battle with armies of armoured creatures comes to the Maldives in their very own epic “Game of Thorns”. Olympic Day today. Celebrated since 1947 to promote the ideals of the Olympic movement of sport bringing people together from across the world. The day also focuses on getting people to try new athletic endeavours. If you are looking to exploit the calm Maldive waters to just try your hand at the Olympic sport of Windsurfing (aka Sailboarding) or want to ride the waters to an Olympics standard, the the Anantara resorts provide the best windsurfing kit around.